These earrings are easy to make and elongate the ear, giving it an appearance of slightly pointed ears. Any of this can be found at an art supply store. 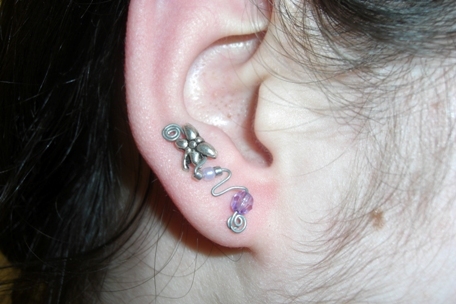 This type of earring is very simple to make, but looks quite intricate, so do not get discouraged. Before we start, I suggest if you are making it for yourself or someone who is easily available, to keep checking that your wire is bending the way that fits with the ear. Everyone has different types and sizes of ears, so it is good to keep checking. 1. Acquire your wire. I personally do not like to cut it just yet because after twisting and bending it they way you like, you don’t always know how long it should be and you don’t want to run out of wire. You first need to make the stopper, which is the base of the earring that ensures that the wire does not go through the ear more than you want. As you can see in the first image, I like to twist it tightly. It does not need to be very big, as long as it cannot go through. 2. 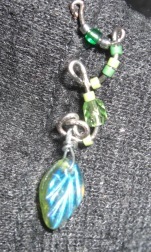 Once you have the base finished, you are free to bend, twist, curl, and bead however you wish. Have fun with this part, and be creative! You can do anything here. 3. To finish off your design, no matter if it has beads on the end or not, it is always advisable to make a very small curl inward at the end so the wire does not poke the wearer when in use. 4. Hopefully you left extra wire for the part that goes through the ear. You can now measure and cut the end how you wish. 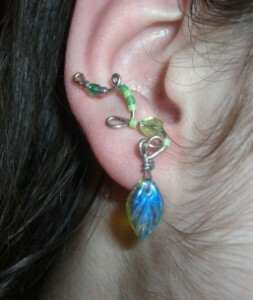 I like to have a long end, sort of like a hanging earring end, then I bend it so that it stays in my ear. See photo 2. And now you are finished! Below are two examples of earrings I made.